LOVE, PEACE & UNDERSTANDING Trini Lopez: If I Had A Hammer (by Woody Guthrie, LP ‘LIve at PJ’s’,1963). FORGOTTEN & OVERLOOKED Tommy Roe (Jam Up, Jelly Tight, 1969) + The Shamrocks (Bala Bala, 1966) + The Nice (Country Pie, Live At The Fillmore East, 1969). SPECIAL: IAN GILLAN *** The Episode Six feat. Ian Gillan: Morning Dew; Mozart vs. the Rest (The Radio 1 Club Sessions, 1968-69); I hear Trumpets Blow (single, 1966); Move, Hate, Revenge ((Single A-Side, February 1967) + choice tracks from Ian Gillan & The Javelins (cd, 2018, ear music). LONGPLAYTIME Country Joe McDonald (Thinking Of Woody Guthrie, 1969) + David Ackles (David Ackles, 1968) + David Garrick (A Boy Named David, 1967). WORD Peter Watkins: The War Game, 1965; Anti Vietnam War Street March; Tim Hardin. LOVE, PEACE & UNDERSTANDING Mungo Jerry: You Don’t Have To Be In the Army To Fight In The War. THE ORIGINATORS & INSPIRATORS Billy Stewart + Mel Brown. SPECIAL BARBARA LYNN: Oh Baby, We Got A Good Thing Goin’, You’ll Lose A Good Thing, Teenage Blues, Second-hand Fiddle + covers by THE ROLLING STONES (Saturday Club 1965, ‘On Air’) + COLD BLOOD (1969) + DEE DEE SHARP (1962). KEEPERS OF THE BLUES FLAME Matthew North: Something Memorable, Still Thinking (cd ‘still THINKING? still DREAMING’, 2017) + Soul Return (Soul Return, Dixie Frog) + Wily Bo Walker & Dany Flam (‘Almost Transparent Blues’, Mescal Canyon, 2018) + Micke Bjorklof & Blue Strip (‘Twenty-five Live At Blues Baltica’, Hokahey Records, 2018). WORD London in the 60s: Mini Skirts and Dolly Girls. THANKS TO Matthew North for Matthew North www.matthewnorthmusic.co.uk and Wily Bo Walker for Wily Bo Walker http://www.wilobo.com . LOVE, PEACE & UNDERSTANDING Steppenwolf: Draft Resister. FORGOTTEN & OVERLOOKED The George Baker Selection (Dear Ann) + Rob Hoeke (Down South pt. 2) + ZZ & De Maskers (Ik heb genoeg van jou). Clive Sands: Marie + The Deejays + The Outlaws feat. Richie Blackmore produced by Joe Meek + The Hep Stars + + Snippets from an exclusive Radio 68 interview with Clive Robin Sarstedt. LONGPLAYTIME Richie Havens: Somethin’ Else Again (1968) + Randy Newman (Randy Newman, 1968) + Ray Charles (Sweet and Sour Tears, 1964). THANKS TO: Clive Robin Sarstedt for the interview. SPECIAL Floyd Jones & Eddie Taylor. LOVE, PEACE & UNDERSTANDING Lightnin’ Hopkins: Please Settle Vietnam. THE ORIGINATORS & INSPIRATORS Bo Didlley + Sugar Boy Williams + Aaron Neville. SPECIAL Floyd Jones & Eddie Taylor: Masters of Modern Blues (B-side, 1967), feat. Fred Below, Otis Spann and Big Walter Horton. KEEPERS OF THE BLUES FLAME Greg Coulson: 10/10 ; Ran Out and Ready (< cd What’s New, 2018) + The Wily Bo Walker Band: Motel Blues (< cd Almost Transparent Blues, 2018). WORD The Weather Underground + Nina Simone. “The Javelins – a band for whom rock history might have passed by long ago had they not ousted their original singer and offered the job to Ian Gillan. That was back in 1962, and over the next two years this eager new beat combo’s career was much like any other at the time – gigging at youth clubs, moving on to residencies at pubs, winning local talent contests, gaining a few screaming girl fans and even making TV at one stage. What they never did do was get into a recording studio”. In 2000, The Javelins did go into a studio to record “Raving” (Purple Records, RMP, 2000). That is not the end of the story, as Ian Gillan recruited his old mates from the original band to record an album drawn from their set-list from… 1963. Typical of the era, it’s a mixture of rock’n’roll, soul, R&B and plain pop. 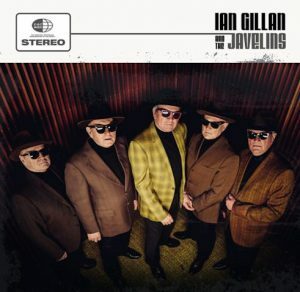 ‘Ian Gillan & The Javelins’ is out on Ear Music. Thanks, V2 Records! A Beaumont native, Barbara never wanted to be anything but an entertainer. Born January 16, 1942, she started learning her craft on a cheap Arthur Godfrey ukelele and was leading her own regional band before she graduated from high school in 1960. Nicknamed “the black Elvis” by friends, Lynn was nurtured by Clarence “Bon Ton” Garlow, a local bluesman and DJ, Lynn also developed song-writing as well as guitar and vocal chops. (…) The first single, Barbara’s own “You’ll Lose A Good Thing”, topped the R&B charts and raced to #8 on the pop Top Forty in the summer of 1962. She had several additional pop charters that year, in 1963 and in 1964 when the Rolling Stones covered her “Oh Baby (We Got A Good Thing Goin’)”, a modest hit for Lynn though it lasted two months on the charts. (…)In any case, instead of becoming a household name who released an album every year or so, Lynn’s recorded output from 1962 to 1986 is limited to her debut album on Jamie and a 1968 “comeback” effort on Atlantic (“Here Is Barbara Lynn”), source of her last pop chart entry, “This Is The Thanks I Get”, in 1969. Clive Robin Sarstedt (° 1944) recorded under a number of names, such as Clive Sands, Wes Sands, Clive Sarstedt and Robin Sarstedt. He was only sixteen when Joe Meek produced his first record. At that time, Sarstedt had Jeff Beck and Richie Blackmore backing him. In the mid-sixties, he joined a British Group that was huge in Sweden: The Deejays. Later, he would secure a contract with America major RCA and release three solo albums. As Robin Sarstedt, he would eventually hit the top of the charts with ‘My Resistance Is Low’ in the seventies. His fame would continue after that in Continental Europe. As Robin Sarstedt, he released a solo album on Angel Air Records in 2016. He lives in Alemeria, Spain, where he still performs and is now working on a new album. His brother Richard aka Eden Kane was a huge star in pre-Beatles Britain. His brother Peter is a world-famous song-writer who scored world-wide with ‘Where Do You Go To My Lovely?’. The Sarstedts are in the Guiness Book Of Records as the only three brothers to make the top of the charts in their own right. RADIO 68 spoke to Robin Sarstedt and you can hear snippets of this EXCLUSIVE RADIO 68 INTERVIEW in this show.